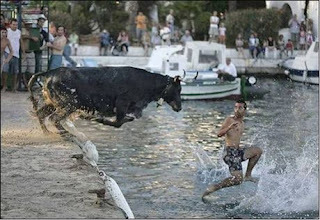 Ok, so everyone knows about the first two dudes to walk on water… Jesus and his apostle, Peter. Well there’s one more, and it happened recently and one of those running of the bulls events. In case you’re from Guinness, I think his name was Jose from some place in Pamplona. In other news, we’ve been anxiously looking foward to PETA’s new “Running of the Nudes” event. Photographers are standing by.